This is actually one movement of a choral setting for three psalms (this is Psalm 133). I haven't written the other two movements, and it is sufficiently complicated that it is unlikely I will ever find people who are both skilled enough and willing to help me do a human recording. 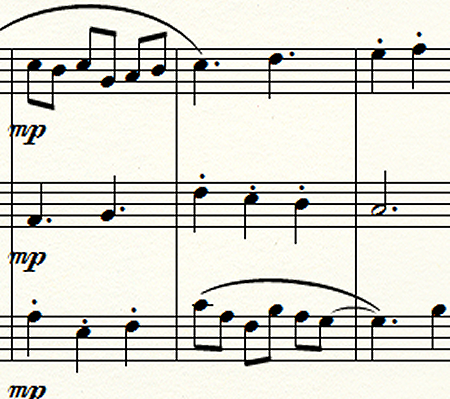 I consequently decided to just put it into woodwinds so I could let you guys hear it. Normally, woodwind pieces have more movement that this, so its choral origins explain that absence. Of course, I don't know four woodwind players either, but Finale® with Garritan® instruments does pretty well with orchestral instruments (don't expect it to give you a believable oud, however—it thinks an oud is the same as a classical guitar). Flute, B♭ clarinet, bassoon, and bass oboe: Alan Humm using Finale® with Garritan® instruments.